US STOCK - Pack of 25, Fast Delivery from LA warehouse via FedEx, 3-6 days delivered. No importing duty. When stock low, the order will be shipped directly from Factory in China within 3days. 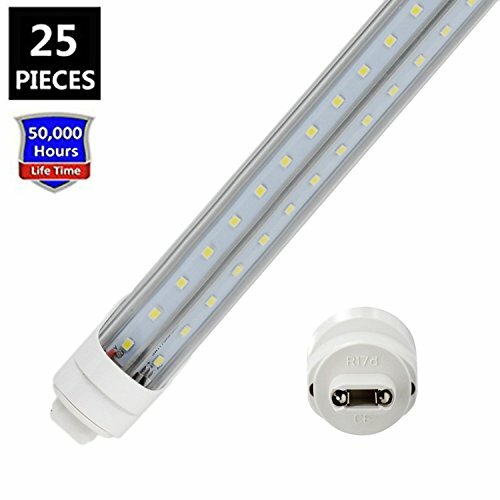 Pack of 25, 72W R17D T8 LED Tube Light, 7200LM, 6000K, Dual End Powered, Endcaps for Horizontal Installation Only, as Shown in Picture. NO BALLAST, NO STARTER - Remove lighting ballast and starter before installing these LED tubes into the fixture. SUPER BRIGHT - 8FT R17D/HO Base V shaped LED tube light, 270 degree LED design, bring your application the best lighting available with an incredible minimum of 120lm/watt. Illuminate the darker corners of your space!.